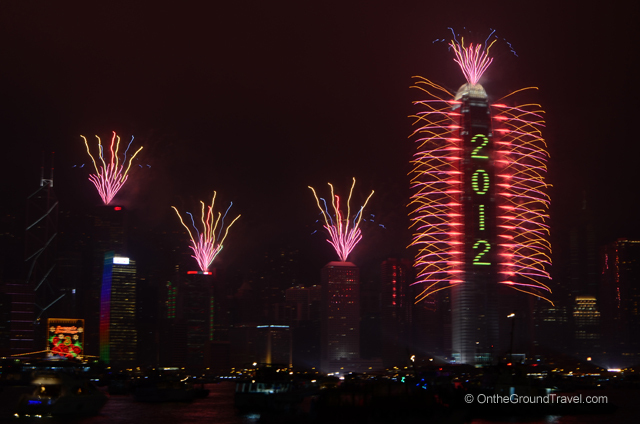 Hundreds of thousands of people gathered along Victoria Harbor in Hong Kong to celebrate the arrival of 2012. This year, the countdown started at 11pm with periodic fireworks shooting off from the iconic buildings along the Harbor every 15 minutes. At midnight, a spectacular pyrotechnics display, with its center along the facade of Two International Finance Center, marked the beginning of a new year. 1) We have recently blogged about the ideal location to watch The Symphony of Lights performance along Victoria Harbor. 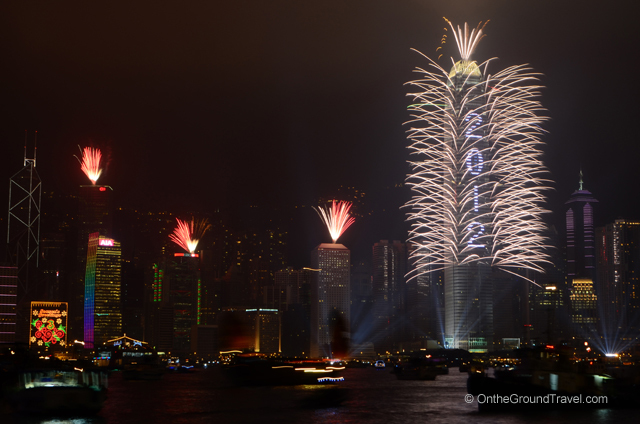 The same rules apply for watching the New Year’s fireworks, including staying on the Tsim Sha Tsui (TST) side rather than anywhere else on the other side of the Harbor. 2) If you find the crowds along the Harbor is too unbearable, then sorry, for New Year’s Eve, the TST promenade is the best and only option you have if you want to watch the fireworks. All viewpoints inside the Ocean Terminal are closed at 8pm to the general public. 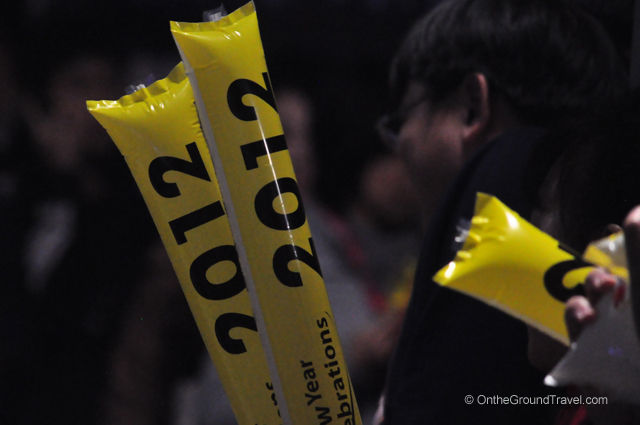 For 2011, the Ocean Terminal had a shopping promotion, where if you made more than $1000HKD in purchases at two different stores inside the Terminal and charged the purchases to a credit card, you would be able to redeem a VIP ticket to view the fireworks from the upper garage. The promotion started around Christmas. Next year if you use this option, please make sure that the store you make a purchase on is part of this promotion. There are several shopping areas connected together to the Ocean Terminal so if you’re not careful you may accidentally walk out of the Ocean Terminal into another mall without realizing it. Note that these tickets are very popular, so hurry and get your hands on them before they run out! 3) Arrive early! We mean Times Square on New Year’s Eve early. We arrived at 7pm thinking that we’d be early enough to find a nice spot to view the fireworks. Really, who would wait 5 hours for a few fireworks!? Apparently thousands of people. 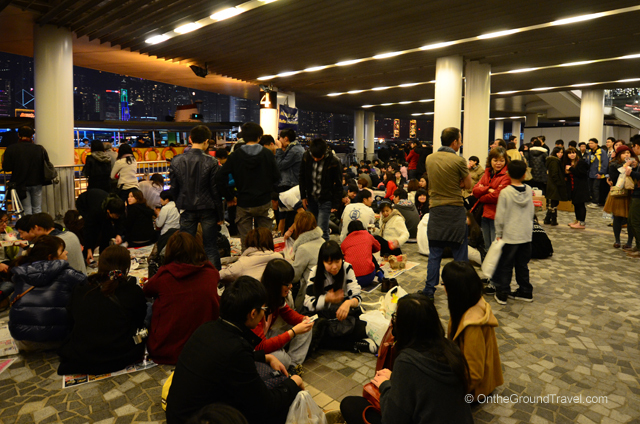 It turns out that the TST promenade is a great picnic area, and so by 7pm, many revelers already settled down with blankets, playing cards, and having dinner. If we were to do it again, we would arrive by 4pm at the absolute latest to stake out a decent spot. 4) If you are like us who typically scope out the location the day before to identify the best photo spots, know that on New Year’s Eve, police typically create a 4-5ft buffer zone along the Harbor. This buffer zone will become an issue for your photography, so if you want to capture a clear unobstructed view of the fireworks from all the buildings (such as the ceiling of the upper level on the promenade) at midnight make sure you plan for it. Experiment with your camera by stepping back several feet from the edge of the Harbor and you’ll know what we mean. 5) Good luck and enjoy the show! Hong Kong also celebrates Chinese New Year with a similar fireworks display, and we are certain that the tips above apply for that day also! 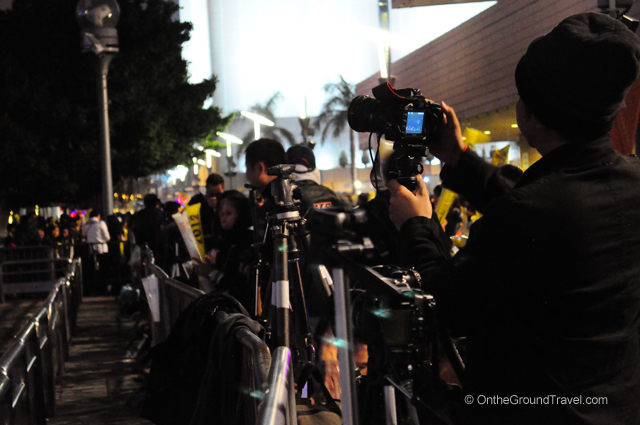 If you missed a good photo on New Year’s Eve and are around for Chinese New Year you’ll have a second chance! Love the firework pics. Happy New Year!